Click HERE for Valentine Cookie Pre-Orders or Classes! Custom cookies and cupcakes for any occasion! An edible work of art! Cookie Orders shipped priority mail for maximum freshness. Unexpected Gingerbread - Most cookies I make are a wonderful soft, mild gingerbread, but other flavors are available. Call 908-887-8241 to order your treats today or email jennibakes4u@gmail.com Our Kitchen is Registered and Inspected by the PA Dept of Agriculture. Cupcakes and Cakes are delivered to the Northeast NJ & PA area only. 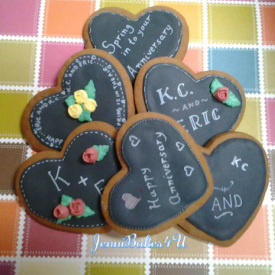 Need a custom cookie for a special occasion? - call or email me!